JFK's Lasting Economic Legacy: Lower Tax Rates President Kennedy presided over a nearly miraculous economic turnaround. At the time of his death in November 1963, corporate profits were hitting record highs and stock prices were soaring. Kennedy also did something that conservatives have been praising ever since: He pushed for much lower tax rates. President Kennedy addresses the nation about the economy in 1962. He presided over an economic turnaround. As the young U.S. senator takes the oath to become president, he sets out to fix an economy struggling with rising unemployment, slumping profits and depressed stock prices. He knows the deep recession could prevent him from advancing his broader domestic and diplomatic agenda. Yes — all true for President Obama. But that's what John F. Kennedy faced as well. On his frosty Inauguration Day in January 1961, Kennedy had to start fulfilling his campaign pledge to "get America moving again." Like Obama, he would need to win over a deeply skeptical business community. The similarities mostly end right there. Since taking office, Obama has struggled with the aftermath of a global financial crisis and a home foreclosure meltdown. Even after nearly five years in office, he presides over an economy stuck with a 7.3 percent unemployment rate and a disappointing growth rate well below 3 percent. In contrast, Kennedy enjoyed a nearly miraculous economic turnaround. At the time of his death in November 1963, an employment boom was beginning. Stocks were soaring, swept up in the emerging "go-go" era on Wall Street — a time when investors were falling in love with mutual funds and conglomerates. So, what exactly did Kennedy do? And as the nation marks the half-century anniversary of his assassination, do the experts credit him with having a lasting economic legacy? 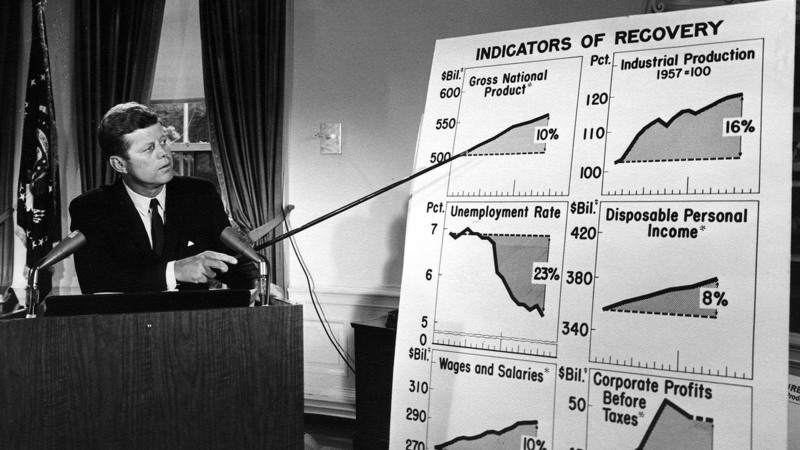 Most historians say Kennedy's long-term economic impact was profound but complicated. Virtually all agree that in the short run, his policies did contribute to that golden era of the mid-1960s when the United States was enjoying one of the most robust economic expansions in history. By 1966 — the year that might have been the fifth of his presidency had he lived — Kennedy would have been presiding over an economy growing at a rate of 6.6 percent and an unemployment rate falling to just 3.8 percent. 'It Takes A Crisis': How '73 Embargo Fueled Change In U.S. Boosting Social Security benefits to encourage workers to retire earlier. Spending more for highway construction. But Kennedy also did something that conservatives have been praising ever since: He pushed for much lower tax rates. In 1962, speaking at the Economic Club of New York, Kennedy said he was committed to "an across-the-board, top-to-bottom cut in personal and corporate income taxes." The tax system, mostly designed during World War II, "exerts too heavy a drag on growth in peace time; that it siphons out of the private economy too large a share of personal and business purchasing power; that it reduces the financial incentives for personal effort, investment, and risk-taking," he said. Many lawmakers worried that reducing taxes without cutting spending would create unacceptable budget deficits. But Kennedy, who famously noted that "a rising tide lifts all boats," insisted tax cuts would generate broad-based growth. Congress finally approved the tax cuts in early 1964, three months after Kennedy's assassination. The following fiscal year, the federal budget deficit did indeed shrink. Stock investors loved it. Between 1962 and 1966, the Dow Jones industrial average nearly doubled. To this day, conservatives point to that robust period as evidence that cutting taxes will lead to higher revenues. But liberals say conservatives' interpretation is misleading because conditions were so different in the early 1960s, when the top marginal tax rate was 91 percent. The Kennedy-backed tax cuts took down that rate to 70 percent. Today, the highest rate is 39.6 percent. Cutting the top tax bracket now would not have the same impact because it already has been lowered several times, the argument goes. "You can only go to the well so many times before you lose effectiveness," says David Shreve, an economic historian who has written about the Kennedy-era tax cuts. Shreve says there's another factor conservatives overlook: Kennedy's biggest tax cuts were aimed at average wage earners in hopes they would spend more. Boosting the demand side of the economy "gave us the widest prosperity and longest unbroken run of growth in history" up to then. In contrast, conservatives focus on "supply-side" cuts, which target the marginal tax rates for wealthier individuals. The goal is to encourage them to invest more and expand output. So for the half century ever since, liberals and conservatives have been debating the lessons of the Kennedy-backed tax cuts. But Allen Matusow, author of The Unraveling of America: A History of Liberalism in the 1960s, says this much is clear: The cuts were game changers. Marginal tax rates never returned to the very high levels of the early 1960s, he says. "These were permanent tax cuts," Matusow says. Kennedy also fought inflation. In 1962, he directed Labor Secretary Arthur Goldberg to mediate negotiations for a steel-industry labor contract. In the end, the steelworkers union agreed not to strike, even though workers would get no raises that year. Kennedy praised the "obviously non-inflationary" contract, as well as the negotiators who demonstrated "industrial statesmanship of the highest order." Then, days later, U.S. Steel CEO Roger Blough announced an immediate 3.5 percent steel price hike. Other companies followed suit. An enraged Kennedy condemned the "irresponsible" businessmen who had shown "utter contempt" for their country. The companies rolled back the price hikes. And throughout the Kennedy years, inflation remained stable and low. But perhaps Kennedy's most lasting economic legacy was the groundwork he laid for eventual passage of the 1964 Civil Rights Act and the Medicare program in 1965. Both had the effect of reducing discrimination in access to hospital care for minorities, especially in the South. That improved the health of many American workers. Matusow says Medicare also helped drive up medical costs as hospitals felt freer to raise prices, knowing they would get reimbursed by government. "Medicare originated as a social welfare program, but it has had economic consequences."